This week’s blog post takes a walk down memory lane to the time when The Office Planning Group was founded. We’ll take a quick look at what this era had to offer by way of office furniture and office systems. Louisiana businesses that have been around for more than 40 years may still have some of these items hanging around in their offices. That’s not surprising since many of the pieces from back then were really made to last. The year 1969 was quite an exciting time to be in the office design industry. Here’s what was going on at the time. Herman Miller had just recently launched the initial version of the Action Office – the brain child of Bob Propst. At the time, this concept of dividing up an open office or “bullpen” with partitions to afford lower rank workers with greater privacy was quite novel. This was the very first in the family of furnishings now known as office systems. 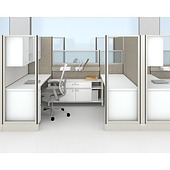 The modular, panel-based structure of these workstations is so adaptable that early models like the AO1 and Steelcase’s Series 9000 from the same time period are still manufactured today. Of course, they’ve got many more components and a few updates. But with their spacious accommodation and sleek design, they are true classics. If you’ve seen the office décor on the hit TV series Mad Men, you’re looking at the type of office furniture you might see in a high-end office suite in the 1960s and early 1970s. These carefully curated TV filming sets feature a mix of furnishings from the 50s and 60s with lots of iconic pieces. The desk designs were boxy and heavy on the wood and metal as you can see here. In terms of materials, things have come full circle in the last 50 years with a renewed emphasis on wood. However, today’s desks are a lot curvier than the designs from back in the day. Chairs tell the story of innovative design, luxurious materials and fine craftsmanship. 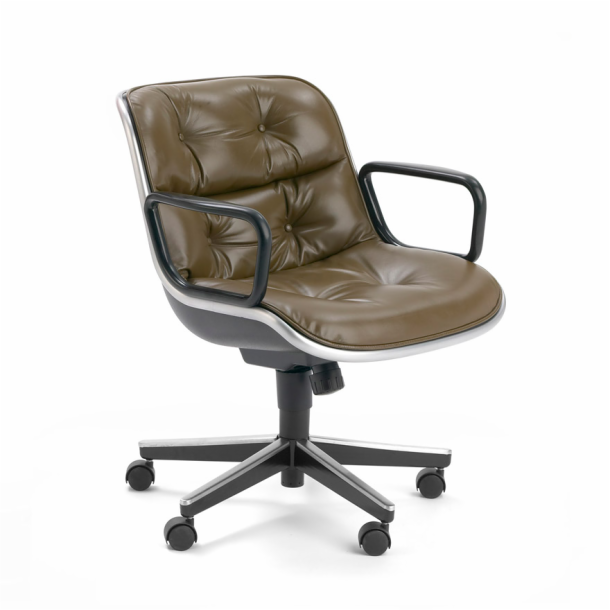 Check out the Eames Time Life Executive Chair with its old four caster base (redesigned with five star base later). Another common seating option for head honchos was the Pollock executive chair with its eye-catching chrome rim. Back then, these designs were very modern. Today, they are retro yet still charming and functional nonetheless. If you have a hankering for vintage office furniture styles, let us know. We’ll see what we can find for you. Share your memories about what office furniture and office systems Louisiana and the rest of the U.S. have enjoyed over the past 50 years in the comments! We enjoy collaborating with our clients to develop and implement a plan that turns their office space into a place where work gets done right. What Is Our Process Like? Are you ready to get started on your office space planning? New Orleans and surrounding areas are our prime business territory. Contact us for a free, no-obligation consult today. Are you thinking about investing in some used office chairs? New Orleans certainly has its share of second-hand furniture stores where you can pick up old task chairs for pennies on the dollar. But these aren’t going to make your workers feel like they are sitting on a fluffy cloud. The fact is that a cheap office chair only gets less comfortable with time. On the other hand, high quality office seating can still be serviceable after many years of use. Here are some tips on what to look for in a “like-new” task chair. The height adjustment cylinder is usually the most mechanically complex component on an office chair. That means it is also the most likely to give out. If the chair is an Aeron, Leap or other brand-name piece, buying new parts and fixing it could be well worth the time and money. Of course, these pricey, ergonomic chairs are also the least likely to have a mechanical failure in the first place. This is another component that can get worn out from being used on the wrong surface or because debris got lodged inside the housing. Test the casters on both carpet and a hard surface to be sure they work well without rattling, scraping, or jamming. This is another part that can typically be replaced if it’s worn out. This is the part of the chair that goes out of warranty first – and for good reason. All it takes is one can of soda or a particularly sweaty office worker to make the fabric sticky or stinky. That’s one reason to look for plastic mesh-back office chairs if you are buying used. As an alternative, you might buy an attractive slip cover designed for a task chair. These are hard to find, so having the chair professionally refurbished with new fabric may be your best bet. Cushions can cover up some upholstery wear. This way, it looks like you upgraded a new chair to be more employee-friendly. Is this all starting to sound like a lot of work? It really is difficult to find excellent used office chairs. New Orleans Office Planning Group finds a few from time to time, but most of our pre-owned inventory is office furniture that doesn’t show wear and tear so easily. That being said, we can certainly find you a great deal on good-quality ergonomic office chairs so you can afford to buy new.